This is the PERFECT addition to your holiday setting. A colorfully sweet Gingerbread House teapot. This one is sure to brighten your kitchen and bring the nostalgia of the holidays to your home. 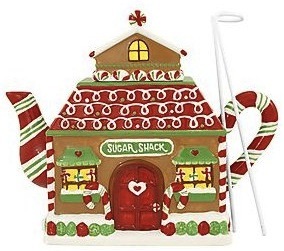 Teapot has gum drop details, candy cane accents and says “Sugar Shack” above the front door. Teapot is hand painted with raised details. This is a must-have for the holidays!! Please visit here for details.